Hi, everybody! It is tough to find info on mixing completely PG-free, given that most mixers seem to use PG-based flavors/concentrates to varying degrees. It’s just way more common. So, I’d like to follow some mixers here to see what kind of concentrates are out there, what tricks and tips you might have that I may not have been able to find, dealing with only non-PG goodies. I’m mixing non-PG for my wife, so, so far, I’m only buying concentrates we can both use. A lot of the info in the past threads is out-dated, some companies that were mentioned last year don’t exist this year so, I’m trying to get an updated idea of things. I have RFSCs and MF on my radar, and found a nice list at WL in the PG-free section, although, there are a few non-water-solubles in there, so look out! I’m pretty certain @Mark_Turner doesn’t use pg and @Amy2 has an intolerance so tries to use as little as possible. Lollipop mentioned @Amy2 which is the first to come to mind. Then recipies from hic-head in clouds but you can’t really follow him, but has a lot of recipes posted. And yes @Lolly your now lollipop from autocorrect. Lol. I do not add PG to any of my mixes. But I will use PG base concentrates. I have been using a lot of the Real Flavors (SC) line, which is a PDO base flavoring. As far as other alternatives I have read elsewhere different ideas on using Triethyl Citrate (Natural) https://shop.perfumersapprentice.com/p-8068-triethyl-citrate-natural.aspx where you would use the pg you’'d plug in the TEC… I have not tried it !!! Here is some discussion on it and it goes on further later on…someone did try it. I’d have to dig further more to find it. TEC would be the emulsion or the colloidal blending the VG which is pretty tough to get all that flavor to bind with it that is why steeping is so crucial for a VG based juice. If I had a homogenizer I could be for sure the flavors and the vg were actually " marrying " and not just well blended but at this time I am only using a magnetic mixer that , is in fact blending it to no end…plenty of white frothy bubbles going on stirring up a reaction with in the batch…you can of course shake it until you see fine bubbles there was a time I only had a USC and ultrasonic waves shake and of course cause a reaction in the batch as well as a large portion of these machines heat up as well and that’s another reaction. I don’t mix my batches with nicotine actually I have been nicotine free now for over a month but the point I am making that the heat would cause your nicotine to degrade after 120F it starts a degrading process. Light oxygen heat time stirring blending these are all issues with steeping ejuice. And don’t get me started on using Distilled Water ( DW ) in your Vg mixes this is further more water down your batches. I did some trials a few summers ago and it was a flop it water downed the flavors and made the batch thin so that when I was trying to vape it I was getting a lot of spit back from the chimney. I would stay at 1% if you were to use it but I didn’t find it successful. MF - can be tricky to nail down %s vary greatly with each concentrate and can realistically be less is more with this brand. Having the equipment is another tricky issue for me as I vape MTL and above ohm so having the thick juice in a MTL set up can be problematic I tend to stick w/ Aspire Mini Nautilus and Tritions for this reason. Good Luck to you man and if you come across another option feel free to let us know ! This is good news, because I have read that some ppl with PG sensitivity are also sensitive to PDO. Thanks for all the help, everyone! I’ll dive into this more later, after work! I love this community. You all rock! Totally ok! I read a thread from last year, @Walt_RealFlavors was trying out the PDO to see what it was all about. That may have caused the confusion. 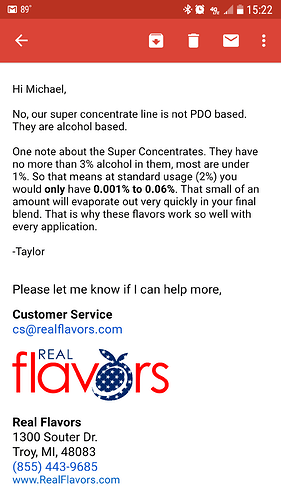 @Walt_RealFlavors himself has stated they use PDO in some flavors, so I’m not surprised some of these flavors fade. These aren’t strictly vaping flavors, but some are stable and hold up well over time… just not all of them. It’s neat to watch a company evolve! They must have been using it at some point. OoO seem to be all PG now. Could there an option I missed? I checked about 6 fruit flavors and all said PG. check out www.naturesflavors.com for zero PG and zero PDO based flavors. ill navigate for you as the site is confusing. they have some extracts made with vegetable gums and thats a def NO! try these OR can go to diyvaporsupply.com for smaller test bottles. NF is kinda $$$ but to me they are very good real tasting flavors that hold their own very well. That is a bounty of awesome flavor! Thanks! I had seen NF mentioned here before, but they fell off my radar. I’ll check the samples out first. I just went through the whole collection on the NF page you linked, though. Lots of options to make some really unique recipes happen, for sure. I trust in BB as well! And since you mention butterscotch… You might have just as well have tossed kryptonite at me.